Gerry Adams: War, Peace and Politics airs this Wednesday and Thursday at 9pm on TV3. VINCENT BROWNE IS making a return to our screens in a brand new two-part documentary which takes an in-depth look at the life and career of Gerry Adams. Gerry Adams: War, Peace and Politics airs tomorrow, Wednesday 7 February, at 9pm and Thursday 8 February at 9pm on TV3. Browne, a regular visitor to Belfast and commentator on the war and subsequent peace process, first met the now-leader of Sinn Féin more than 40 years ago. In this two-part programme, Browne journeys back there and further afield, to chart the role of Adams in the Northern Ireland conflict, his part in the peace process and how, under his leadership, Sinn Féin has transformed itself into one of the largest parties on both sides of the border. Born in Belfast on 6 October 1948, Adams came from a staunch republican background. His father was an IRA man who was jailed for eight years for his role in an ambush. As a teenager, Adams became an active Republican and a key figure in the 1960s civil rights movement in the North. Adams was interned without trial in 1972 and 1973, in the early years of the Troubles – the 30 years of violence in which 3,500 people died. He was charged with IRA membership in 1978 but the case was subsequently dropped due to insufficient evidence. Adams always publicly said he was never an IRA member. To many, Adams is a peacemaker, the man who lead the Republican movement for so long, but for many others, predominantly the unionist population, he is a loathed and distrusted figure who justified murders carried out by the IRA. In an opinion piece with the Irish Times on Saturday, Browne said that the hatred towards Adams is unfair. “It is hardly surprising that Adams, who officially steps down as Sinn Féin leader next week, is so loathed and distrusted by the unionist population in Northern Ireland, by a large number of people in the South, and by many others elsewhere,” Browne said. Adams took over the leadership of Sinn Féin in 1983, 11 years before the IRA ended its campaign of violence and 15 years before the Good Friday Agreement. He was first elected to Westminster in 1983 and was elected to the Dáil in 2011. He announced that he would be stepping down as party leader late last year. Mary Lou McDonald will formally take his place on 10 February. Email “Vincent Browne returns to our screens with documentary on life of Gerry Adams ”. 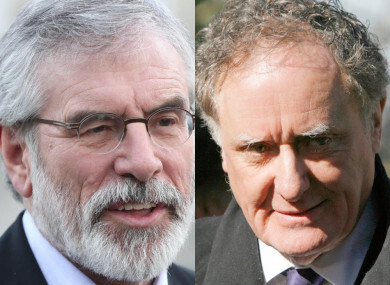 Feedback on “Vincent Browne returns to our screens with documentary on life of Gerry Adams ”.